A Burn is a reaction of the skin and possibly deeper tissues caused by heat, chemicals, electricity, cold, radiation, and/or friction. All severe Burns should be evaluated by a trained medical professional, as soon as possible! DO NOT wait! Failure to obtain evaluation as soon as possible may result in serious injury or death. Call 911 (or your local emergency number) immediately, if you have experienced severe Burns. 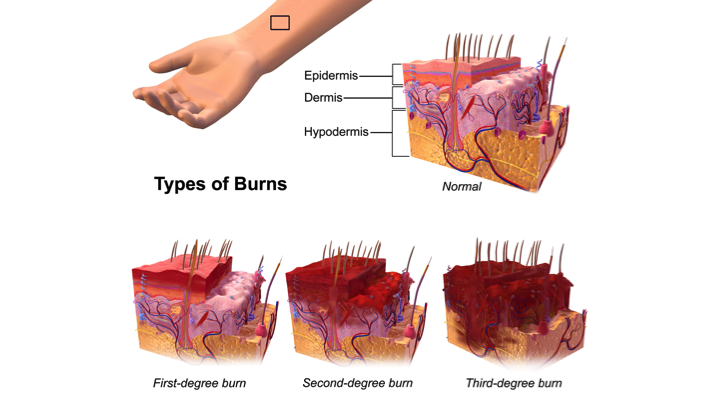 What are the Signs and Symptoms of Burns? How is First Aid administered for Burns? Who should administer First Aid for Burns? What is the Prognosis of Burns? Cuttle, L., Kempf, M., Liu, P. Y., Kravchuk, O., & Kimble, R. M. (2010). The optimal duration and delay of first aid treatment for deep partial thickness burn injuries. Burns, 36(5), 673-679. Cuttle, L., & Kimble, R. M. (2010). First aid treatment of burn injuries. Wound Practice & Research: Journal of the Australian Wound Management Association, 18(1), 6. Peck, M. D. (2011). Epidemiology of burns throughout the world. Part I: Distribution and risk factors. Burns, 37(7), 1087-1100. Gandhi, M., Thomson, C., Lord, D., & Enoch, S. (2010). Management of pain in children with burns. International journal of pediatrics, 2010. Kasten, K. R., Makley, A. T., & Kagan, R. J. (2011). Update on the critical care management of severe burns. Journal of intensive care medicine, 26(4), 223-236. Abeyasundara, S. L., Rajan, V., Lam, L., Harvey, J. G., & Holland, A. J. (2011). The changing pattern of pediatric burns. Journal of Burn Care & Research, 32(2), 178-184. Rayner, R., & Prentice, J. (2011). Paediatric burns: a brief global review. Wound Practice & Research: Journal of the Australian Wound Management Association, 19(1), 39.